Master Shotokan Karate from Home - Regardless ​of Your Schedule or Experience Level. Are you tired of saying that someday you'll start training again? Now is the time. YOU WILL BE GUIDED FROM WHITE TO BLACK BELT. EVERYTHING IS INCLUDED. 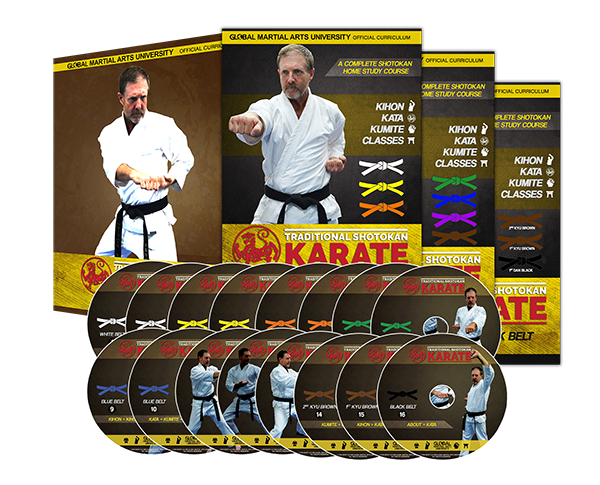 This might be the most comprehensive shotokan karate course ever created. Every single basic technique (kihon), self defense movement (kumite), and form (kata) is instructed. There are also follow-along classes and drills for extra practice. SHOTOKAN IS A TOTAL BODY WORKOUT, FOR ALL FITNESS LEVELS. Unlike running on the treadmill (which doesn't work enough muscle groups), or doing a crossfit class (which could be too intense), a shotokan karate workout will engage your core, upper, and lower body in harmony. Training is invigorating while still safe for your joints. YOU HAVE THE ABILITY TO EARN REAL RANK AND FINALLY REACH BLACK BELT. Want to take your training to the next level? You have the option to enroll as an official student to take tests, get instructor support, and earn accredited rank at your own pace. BE CONFIDENT ON THE STREETS AND LIVE STRESS FREE. 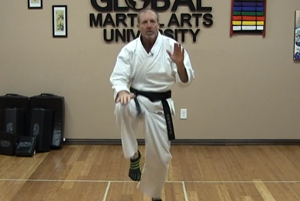 Karate self defense techniques are life-saving fighting movements, when practiced corrected. Our students mention how they notice less stress and a more centered life when they consistently train. You will learn about the style, how to use the course, about Japanese terms, and how to succeed. 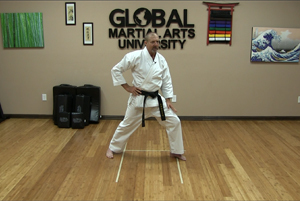 Stances, Punches, Strikes, Blocks, and Kicks are all instructed (with correct Japanese terminology), and drills. You will learn Ippon, Sanbon, Gohon, Kaeshi, Jiyu Ippon, and Jiyu Kumite. Which are all different fighting forms. All kata(s) from white to black are instructed, just as Funakoshi taught them (the founder of shotokan). Each belt level includes a 30 minute class. This is just like attending a real class at Sensei Jon's dojo. After a detailed instruction of each technique, there is an included practice drill to get more repetition. 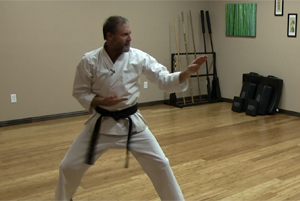 Jon Hodge currently holds the rank of 6th dan black belt in shotokan karate-do. 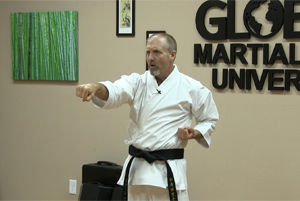 He has taught martial arts for nearly 20 years. 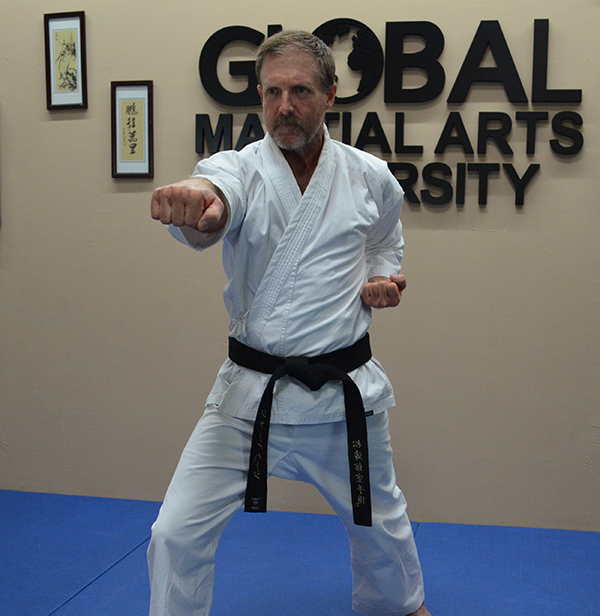 Over the years Jon has studied many different forms of martial arts and is also a Master Chi Kung and Tai Chi instructor. 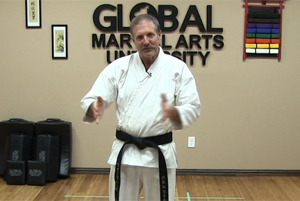 He is the Master Instructor (Shihan) of the Global Martial Arts University Shotokan Karate course. 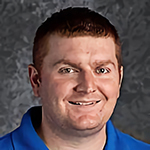 When not training or teaching, you can find Jon traversing state or national parks on his motorcycle or RV. 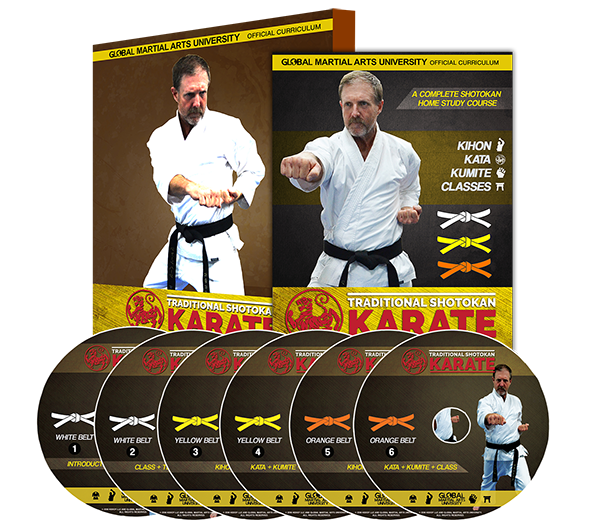 “Sensei Jon and Sensei Michael have put together an efficient and fun Shotokan Karate curriculum that is sure to help Martial Arts students increase in skill and knowledge. The online format is comparable to many online colleges and universities. It is easy to navigate and very detailed. Sensei Jon does an excellent job speaking to the beginner and the Black Belt. 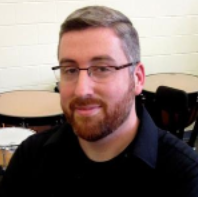 He breaks it down in an easy, enjoyable practice. Don’t get me wrong, the curriculum is not easy and it does take hard work, time, and energy. But…that is because it’s the real deal. 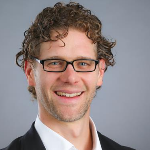 Students can earn accredited rank and an increased skill base regardless of their prior knowledge." You have a busy schedule, and cannot commit to local classes. You have some previous martial arts experience, even if in a different style. You are self-motivated and have good self-discipline. You have a 1-2 hours a week you can set aside for training. You learn best with a live teach and social group class. You need to be constantly motivated and reminded why you need to be training, exercising, eating right. You want to earn a black belt just so that you can tell others about it and put it on your wall. If you struggle with learning from a video. 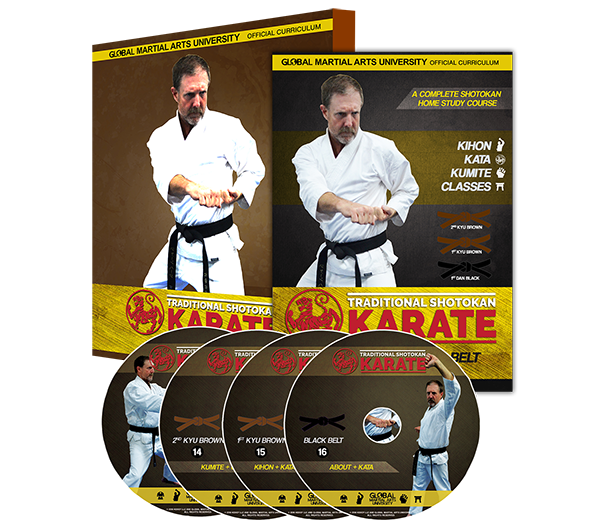 We back up the Traditional Shotokan Karate Home Study Course with a 30 day money back guarantee. If you don't see the results you were expecting, or are just not happy, we will give you a full refund. 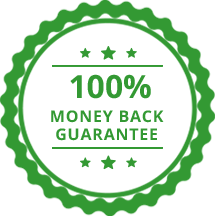 We have been creating home study courses since 2008, and have received less than ten returns to this point. We know you'll love the training! Not only will you get the videos, but some extra bonuses with your course. 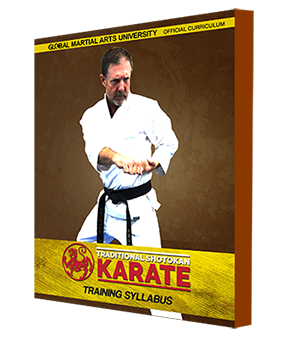 This is the official Global Martial Arts University Shotokan Karate syllabus. It includes the exact curriculum for each belt level throughout the course. It is an excellent training reference that you can read on your device or print out. It comes in a convenient .pdf format. 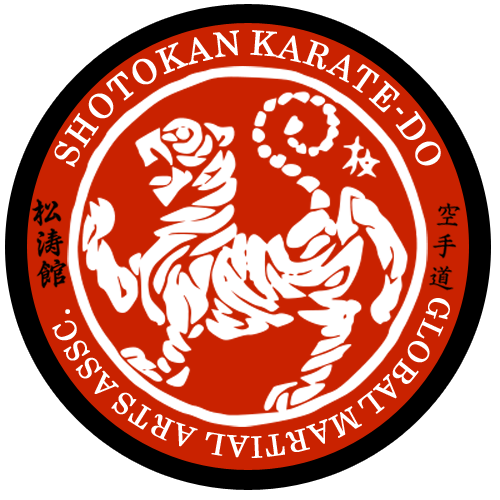 If you purchase the DVD + Digital edition, we will include the official shotokan karate-do student patch. On your gi, place it on the left side of the chest (over the heart). All course purchase options also include a streaming and downloadable edition. You will get instant access to all videos which you can stream on any device, or download them for offline viewing. Start with just the first few belt levels, or get the entire course. How do I enroll as an official student to earn rank? After purchasing one of the training courses, visit the Choose Your Student Membership page to get enrolled. Immediately after purchasing, you can watch all videos in a browser on any device. Or, you can download the videos for offline viewing. Do I need a partner to train in shotokan? Although it is not a complete necessity, it can be helpful to have a training partner. The techniques can be practiced solo (preferably with a mirror or punching bag). Kata and kihon (basic techniques) can be practiced solo without any equipment. We ship to any country in the world. If you are not certain about your local postal system, it might make more sense to purchase the digital edition. Don't Wait Another Day. Begin Your Journey to Black Belt! © 2019 Hodgy LLC. All Rights Reserved.